Now your child can play with his favorite character with this Character Licensed Activity Table Set. The Set comes with 1 table & 2 chairs. Bright colorful graphics & large table surface for drawing, eating & playing. Vinyl surface is washable. Made of sturdy metal tubular construction. Adult assembly required, tool included. Chairs include a Safety Locking Mechanism. Chairs have a recommended weight limit of 70 lbs. 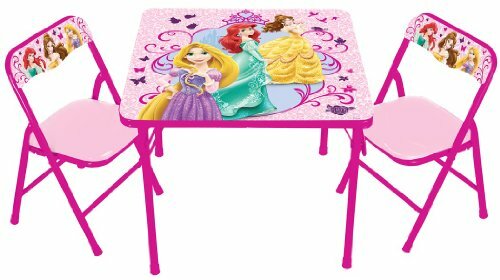 Now your child can have hours of fun with this Princess True Princess from Within Activity Table Set.